If you are a consumer on the low end of the credit spectrum, you may be sweating over the choice of plunking down a large deposit for a secured card or paying a small ongoing fee for an unsecured card. In the case of the Discover it Secured card, the large upfront cost is well worth it in the long run. Not only can you earn a profit off the card through its cash back rewards program, but you can get your security deposit back in as little as eight months through responsible credit use, putting you heads above the alternatives for building credit. The Discover it Secured card allows you to establish your credit line with a slightly smaller than average deposit. While many secured cards require at least $300 up front, the Discover it Secured card lets you start an account with as little as $200. 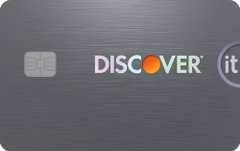 The Discover it Secured card also starts you off with a decently sized credit line – if you can foot the deposit. The card allows you to choose a credit limit as high as $2,500, but you are required to secure the entirety of that credit line with a deposit. As a major plus, Discover promises to review your account on a monthly basis starting at eight months to see if you qualify to graduate to a unsecured card. In a relatively short time, you could have your deposit fully refunded while enjoying the benefits of Discover’s cash back rewards program. The Discover it Secured card isn’t the only card in the credit-building realm with cash back rewards, but, unlike most competitors, the Discover it card’s cash back program isn’t a subpar version of the rewards that it offers to cardholders with more desirable credit scores. You’re entitled to the same rewards that Discover offers to its Discover it chrome cardholders: 2 percent cash back on restaurant and gas station purchases (on up to $1,000 in combined purchases per quarter) and 1 percent cash back on other purchases. Plus, Discover matches all of the cash back that you earn at the end of the first year, basically doubling the card’s rewards in the first year. While many cards for building credit charge an annual fee (or even multiple fees!) the Discover it Secured card doesn’t charge an annual fee, and does an even better turn: With the card’s valuable cash back rewards program, you can actually earn money back each year by using the card. We estimate that a cardholder who spends an average amount in each of the card’s categories and around $3,600 on the card each year can earn around $62 per year on the card over three years. In other words, the Discover it Secured card is far more rewarding than most of its competitors. Unfortunately, the APR on the Discover it Secured card is extremely high – even for a credit-building card. All cardholders, regardless of their credit score, are assigned a 25.24 variable APR. You need to make certain before you apply for the card that you have a plan in place to pay off your balance each month, since carrying a balance from month to month can be costly. On the bright side, the Discover it Secured card offers more forgiving terms for inexperienced credit card holders. For one, it offers an introductory APR of 10.99 percent on balance transfers for the first six months (for transfers that post to your account by April 10, 2019). Also, the card doesn’t charge a penalty APR and guarantees not to raise your APR if you skip a payment. While you won’t be charged a penalty fee the first time you pay late, you will face a hefty fee of up to $37 for each subsequent late payment. Additionally, you will be charged up to $37 for each returned payment – so you’ll want to be careful about staying on top of your payments. Free FICO score – Get a monthly scorecard of your credit, including your current FICO credit score. No foreign transaction fee – You can use the card to make purchases outside the country without having to pay a transaction fee. Social Security number alerts – Get an alert if your Social Security number is found on a risky website. Credit report alerts – Get an alert any time any time a new credit card, mortgage, car loan or other type of account shows up on your Experian® credit report. Emergency card services – Free overnight shipping for card replacement to any U.S. address at your request. The odds of approval are high for most cardholders with the Discover it Secured card. The card is available to new cardholders with no credit history as well as cardholders with poor credit scores seeking to rebuild their credit histories. Applicants need to be at least 18 years of age and have a U.S. bank account with a bank routing number. Discover will do a review of your credit report and you may get declined if you have serious detractors on your report, such as a pending bankruptcy. Why get the Discover it Secured card? You want a card that helps you build credit and lets you earn valuable rewards in the process. You want a credit-building card that’s going to offer the most value in the long run. You want a card that gives you a chance to upgrade if you make timely payments. You can afford at least a $200 deposit. You want a card that’s more forgiving on late payments. Put down a larger deposit than the $200 minimum if you can afford it. This will boost your credit limit on the card and improve your overall credit utilization ratio – a major factor in your credit score. Don’t miss a payment. Discover will waive the penalty fee the first time, but you’ll still get hit with interest, and it could go on your credit report and reduce your chances of getting approved for a higher limit with Discover once your eight-month review comes around. Keep your credit utilization on the card below 30 percent – limit your purchases with the card and make multiple monthly payments if you need to. That said, make sure you’re making at least one purchase with the card each month. Consider putting a repeating monthly purchase on the card (e.g., your gym membership) and creating an automatic payment from your bank – this will help you build up a credit history, without the temptation of spending more than you can afford. Avoid carrying a balance on the card since the APR is high. Use the card for restaurant and gas purchases – you earn the most cash back on these categories.